Start the sauce first. Heat the olive oil in a medium sized saucepan. Add the onion and garlic. Saute until the onions are softened. Add the remaining sauce ingredients. Cook, stirring occasionally. In a medium sized bowl, add all of the meatball ingredients. With a gentle hand, combine all ingredients and form into 1 to 2-inch meatballs. Place on an (oiled or nonstick) broiler pan and broil for about 5 minutes or until just starting to brown. Add to the sauce. Continue to cook until the meatballs are fully cooked and most of the liquid has been cooked out of the sauce. Serve over hot spaghetti. Pro tip: Leftover meatballs in sauce freeze remarkably well. 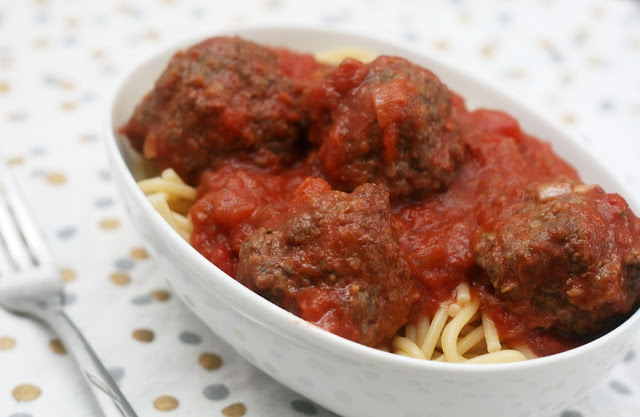 Just because it is summer doesn't mean one can't crave spaghetti and meatballs! As a nod to the season, I added some grated (and squeezed dry using a paper towel) zucchini which pretty much everyone has on hand right now. It isn't quite tomato season here yet (all I've seen are cherry tomatoes and puny ones at that and the ones on my plant are still super green) so I went with canned tomatoes but if you have fresh, by all means, use that! Just peel and hand crush/chop them to equal the appropriate amounts. Either way, the dish was a fresher, more summer take on the traditonal favorite and only heated up the house a little bit.